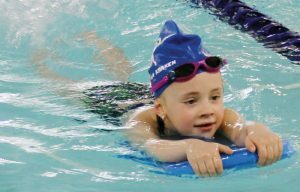 With no school last Thursday, 12 swimmers from the Claresholm Junior Lifeguard Club Vikings took to the pool to raise money for their club. 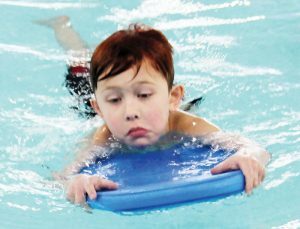 The third annual Swim-a-thon took place on Jan. 31 at the Claresholm Aquatic Centre with participants swimming a total of 989, 25-metre lengths of the pool, which equates to just over 24 kilometres. “It’s pretty phenomenal,” said Denise Spencer, the town’s recreation manager. Proceeds were still being counted at press time, but they will be going to the Junior Lifeguard Club Vikings to purchase equipment and help offset the cost of attending competitions. Spencer noted the cost of attending competitions has increased. “I don’t want it to be a cost barrier to join the club,” she said. In fact, a fund has been set up for the Junior Lifeguard Club Vikings to help pay for competitions. The season has not yet started for the Vikings, but is set to begin in Calgary with an event March 2 and 3. There will also be a competition in Lethbridge on March 16 and 17, and provincials in Spruce Grove on April 6 and 7. “We do our best to make sure the cost is not a barrier,” Spencer said. This year’s team has 13 members, who are coached by Dallas Walker who has competed nationally and internationally in the lifesaving games. “We’re really excited to have her,” Spencer said. Unlike a regular swim club, who race from one end of the pool to the other, Junior Lifeguard Club teams use swimming fins, rescue teammates with a rope, or save a plastic manikin with a lifesaving device. This is a sport that competes worldwide and is growing quickly.